Commuters have endured a day of industrial action on some of the busiest routes into London. South West Trains (SWT) warned passengers not to travel as services were not running on many routes and just 10% were operating on others. Many people drove into work as others took the day off to avoid the chaos. About 900 SWT staff, who are members of Aslef, went on strike at midnight for 24 hours, in a row relating to previous action when managers drove trains. SWT said one in four drivers scheduled to work on Tuesday had reported for duty and that many trains were being driven by drivers rather than managers. On many routes into London's Waterloo station there were no trains while buses were laid on to replace trains in some parts of the South East. 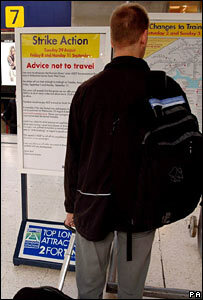 Passengers from major terminals such as Brighton, Portsmouth, Plymouth and Reading were able to get into London, but not Waterloo, using other train operators. But those travelling from more remote areas struggled to get a train. SWT said many remote stations where trains were running were quieter than normal, suggesting people had listened to the advice not to travel unless necessary. But a few braved skeletal train services to get them to work. One commuter said: "It was wonderful. The train didn't stop at Surbiton so the train was not crowded. It was better than normal." Drivers on the Heathrow Express from Paddington in London to Heathrow Airport were also on striking in a separate dispute. Aslef said further strikes planned for 8 and 11 September would go ahead unless the deadlock was broken. The dispute started earlier this year when there was a disagreement involving Waterloo-based drivers over the use of taxis to and from work. During a strike managers were used to drive trains but Aslef said SWT contravened an agreement they would only drive trains in cases of health and safety or the possibility of civil unrest. The union also raised concerns over safety, claiming that one manager had not driven a train for 10 years. The company denied the union's claims and insisted that only fully-qualified managers had driven trains. Managing director Stewart Palmer said: "Some of our drivers probably are under a bit of pressure today but I'm pleased that they have had the courage of their convictions and come into work today." Aslef general secretary Keith Norman said: "I believe the company is using its passengers to try to score points over the union. "I am only sorry that the public will suffer, rather than this appalling management."